This provocative volume, one of the most important interpretive works on the philosophical thought of the Renaissance, has long been regarded as a classic in its field. 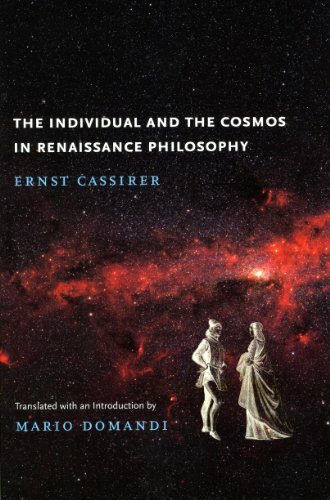 Ernst Cassirer here examines the changes brewing in the early stages of the Renaissance, tracing the interdependence of philosophy, language, art, and science; the newfound recognition of individual consciousness; and the great thinkers of the period—from da Vinci and Galileo to Pico della Mirandola and Giordano Bruno. The Individual and the Cosmos in Renaissance Philosophy discusses the importance of fifteenth-century philosopher Nicholas Cusanus, the concepts of freedom and necessity, and the subject-object problem in Renaissance thought. Ernst Cassirer (1874–1945)was a philosopher and historian of philosophy. He taught at Friedrich Wilhelm University and the University of Hamburg, where he was Leo Strauss’s dissertation advisor, before fleeing Nazi Germany in 1933. In exile, he lectured at Oxford, Sweden’s Gothenburg University, Yale, and Columbia. His better-known works include the three-volume Philosophy of Symbolic Forms and The Myth of the State.